I am delighted to share the news of our progress and the remarkable milestones we have accomplished over the last few months. As one of the leading organizations providing Academic and Financial Literacy Education to the children and youth of Southern Nevada, we deliver a full range of unique and innovative learning programs across the valley. For the past few years, our fundraising efforts have been quite minimal. In many ways, we have been shy about asking others for money before proving results. But April catapulted our philanthropic quest to a whole new level as Andson joined the selected group of charities that benefit from the Annual Governor's Black-Tie Invitational. With a wonderful gift of $80K, the Southern Highlands Charitable Foundation is fueling our work to equip students with the tools they need to achieve intellectual growth and academic success. May marked the completion of the 2012-2013 school year. Eight months in which over 2,500 students across the Las Vegas Valley received supplemental education through our Academic Assistance program and tailored Financial Literacy classes. We graduated approximately 800 students in our Homework Help & Tutoring program with notable improvements of one to two grade levels in all areas – these students enjoyed pizza parties and received certificates of achievement! Simultaneously, almost 2,000 students from kinder to high school seniors at three different public schools learned the basics of personal finance and money saving habits. May also marked the installation of a diverse and fully functional Board of Directors. Armed with a new president, secretary and treasurer, we are prepared to embark on a strategic planning process that will allow us to grow sustainably, deepening in breadth and impact. Moving into the summer season, we all look forward to continuing our efforts in education by delivering a summer reading program and hosting Andson's Back to Class Bash on Saturday, August 3rd – sponsored by St. Rose Dominican Hospitals and the Southern Highlands Community Association. On behalf of the Board of Directors and Staff, we would like to thank you for your friendship and hope that you will consider joining our various initiatives – together we can make a difference! Andson Academics helps education now. Over the next several weeks, we will celebrate, as thousands of students graduate from high schools, colleges and universities. Unnoticed, however, will be the additional thousands who will not graduate. With less than 61 % of Clark County’s high school students graduating, and a very small percentage of those graduates attending college, we trail the rest of the country in the area of a qualified pool of future employees, and an educated workforce. We, as a community, have much work to do to. Clark County School District (CCSD) is the 5th largest school district in the country. As of March 2013, there were more than 311,000 students enrolled in our schools, 71% of Nevada's public school population resides in our school district. This disparity creates a tremendous hardship on our school system to serve our students adequately. The fact that our district is underfunded is a much known statistic, one that is being widely addressed in our legislative sessions and political public hearings. Those efforts will no doubt result in increased funding for our region in the near future. Meanwhile, however, we cannot neglect the tens of thousands of students that are currently struggling in their daily studies and are in danger of dropping out of school, and simply go unaccounted for. Early education, and giving our children the tools to succeed isn’t an idea we should strive towards, it’s what we need to do. Excuses as to why our children are not performing at national standards are not appropriate at this time. Early involvement has a direct impact on low income and other demographics that are at a high risk of falling behind. Many children arrive at school enrollment already behind. A recipe for failure is already in place, if additional support is not provided to these students to bring them to the appropriate level of knowledge. Building a child’s vocabulary, and teaching him or her to count to 100 at the earliest age sets the platform for success in a classroom and, ultimately, in life. As a community, we, the business leaders need to inspire Southern Nevada’s citizens to get involved, whether by way of time, and or resources. Together we can give the children of Clark County a better chance to succeed. The students in our district today, will be Southern Nevada’s work force tomorrow. Lets give them the opportunity to contribute and build our economy. English Language Learners (ELL) is a significant portion of our student population, recent figures show that over 53,000 of CCSD students are enrolled in ELL services, but according to teachers’ reports, approximately 100,000 students are identified as ELL. These students will ultimately fall behind their peers if additional resources and services are not provided to them. Nevada has the highest percentage of ELL students with little or no resources directed to their specific needs. With such a predominant role in the composition of our student population ELL students’ success rates have a direct impact on the performance of our school district and our state. To ignore the needs of this demographic will hinder the performance for the entire Southern Nevada School system. We have a tremendous task ahead to transform our education system and work collectively to ensure that the children of our community will experience the thrill of "donning the cap and gown with a sense of pride and achievement", and progress to become an educated and successful generation. This will not be a quick fix; it will take us, the employers, community leaders, and entrepreneurs to make the commitment to provide our students with the support, tools, and resources they need to succeed. Our students cannot wait another two or three years, for legislature to take effect. Southern Nevada cannot wait on legislation to improve the value of our city. "Every two years is another two years of students who will not pass the critical third grade reading gauge, two years of dismal sophomore math scores, two years of an unacceptable graduation rate, and two years of widening the gap between opportunity and achievement. We, as a community, need the transformation to begin today"
After school programs such as what we at Andson provide to students, are the roadways to their success. With as little as one hour per day of personal or small group attention, students, on average improve as much as two grade levels in reading and math. Although a large majority of the students we serve are ELL and/or children for low-income families, this need is not limited to these demographics. We live in a world of the Hospitality Industry; most of our professional- working parents are employed within that field. In the evenings, when the children are in need of assistance and discipline with homework and studies, parents are, unfortunately, working. Their children need our support just as much, so that the parents can continue to be part of our educated workforce. “Homework not only reinforces what was learned in the classroom, it also teaches and develops independent learning skills. In the early years of a child's education, little homework is given. Simple math problems, studying spelling, practicing handwriting, and reading are typical homework assignments of an early learner. These are all skills that are best learned by repetition and practice. These are also the skills that must be mastered before the student is introduced to more advanced concepts. Homework is an effective method of reinforcing these skills. Students who practice their spelling words become adults who can spell. Students who practice their multiplication tables have an easier time learning division. Students who do homework every night learn skills that are necessary for educational success. Students learn about their own learning styles. Most children do not like homework. A student’s dislike of homework, or rather their like for everything that is not homework, will motivate students to get through their homework quicker to get to the things that they want to do. Though this may seem like a bad thing, it motivates students to find what method of learning works best for them. As children advance through school, more homework is given. Students who have found which methods of learning work best for them will have an easier time managing loads of homework in the future. Through partnerships with organizations such as the Boys and Girls Clubs, Communities in Schools, St. Judes Ranch for Children, Walter Bracken Elementary School, Vegas PBS, and several others within the valley, Andson Academics provides the assistance, guidance, discipline and reinforcements to hundreds of students throughout the school year. It is our determination and goal to encourage a lifelong love for learning amongst our young citizens and to provide them with the assistance they need along the way. With that foundation in place, and with the support of our business and community leaders, we will produce successful and productive citizens. Having Fun While Learning About Money! What can we do to make it fun for children to learn about money management? How about add music? That is exactly what the Boys & Girls Clubs of America (BGCA) and the Charles Schwab Foundation are doing, and children are jumping at the opportunity to learn and be apart of the experience. The Boys & Girls Clubs of America and the Charles Schwab Foundation are making an impact on teens that are learning about finances in a fun way. The two organizations have worked together to start the Money Matters Music Mogel (M4) contest that incorporates the Money Matters: Make It Count programs with music, allowing teens to have fun while learning. The Money Matters program teaches teens about money managing skills at more than 2,900 Boys & Girls Clubs across the country. The contest has teens take what they have learned in the program and allows them to incorporate the knowledge into original lyrics that are accompanied by beats created by Grammy-nominated Kevin “Khao” Cates. Once the songs are created, they are put to a vote and the winner receives $1,000 in scholarship funds and $1,000 to his or her BGCA club. Also, the winner will have the opportunity to create a music video to go with the song. Four finalists receive $500 each. The previous winner was from our very own town of Las Vegas! Syretha Shirley of the Boys & Girls Club of Las Vegas won with her song, “Time is Money”. Congratulations Syretha! I wonder who the next winner will be? Your child has been sick for a few days and now he or she is feeling better, but you think that missing one more day will be no big deal. Think again! Missing school can make an impact on a child's education in the future. Of course, a child can always make up work but will that child really be getting the proper education that he or she will need for the future courses and material learned. Of course parents are aware that missing school is not a good thing for students, but often times parents do not even notice how many days their child is really missing. And it is not their fault for not knowing. According to new studies found in a recent article done by USA Today, 90% of students come to school. Though that percentage looks desirable, where are the other 10% of students? Approximately 7.5 million students miss a month of school each year. These “chronically absent” students become at “high-risk” of dropping because of the challenges they face academically as a result of missing school for long periods of time. Many parents often do not recognize the issue because they are not presented with an overall report of absences. Each parent receives a report card four times a year. The quarterly report shows the individual, quarterly absences, but there is no summary at the end of the year with all the absences on one report. Perhaps making parents aware of the effect of absences on academic performance might result in an increase in the success rate of graduating students. Children are bound to get sick, and will have to miss school for sick or personal issues, but there must be a way to keep track of how many days a student will be missing. It is important for students to learn the lesson of the day in the classroom environment where he or she will be able to ask questions and get the help he or she needs when struggling with learning. We want our children to overcome challenges in the future. When did you have your Financial A-Ha! moment? Some people are born financially savvy, some learn from their parents. Even more, however, may never learn - and hence struggle for years, living paycheck-to-paycheck and paying high interest rates. When reading Kentin Waits' article recently regarding his financial awareness, I realized that there are such pivotal moments in the lives of young people, that we have got to keep doing what we do, because if Andson can provide this for even one student, then it's all worth it. Waits, at 13, was allowed to manage the $120 per month Social Security benefit allotted him. This article isn't pivotal, it's not as if he's a millionaire now. What it gave him, though, was even more beneficial - it gave him the groundwork to think about money; really think about it. You can "be born" with a sense of frugality, but in reality it comes from societal influences and culture - whether in the home or a little further out. Personal Finance is absolutely a learned behavior. Waits was given the opportunity to learn. I had that same moment at one point in my life, the first time I couldn't pay my credit card off the same month it was due. It took a little longer than Waits, I was 18, but it sunk in nonetheless. Those are the moments we want to provide to students and youth through Andson's activities. It's why we are working on The Piggybank Project, why we are expanding our reach in 2013 to High Schools, it's why we exist. So, we ask you, have you had that "A-Ha" moment yet? At Andson, we are striving to diversify our programs and give back in our local and surrounding communities in exciting new ways. Being that we are a small group - this is easier said than done. One area that we want to expand on is mentoring. This has not been a mass effort - nor has it been achieved on a broad scale. The impacts we've made however, certainly are significant to those we've mentored. Most youths mean well - they may have a few traits that need "tweaking," or they could even need guidance that is lacking on the home or school front. We want to touch on two cases that were encountered in the past few months where individuals from Andson have made genuine impacts on the lives of young people. Jason is a youth from a Boys & Girls Club who had his future in order - he graduated from high school knowing exactly what he wanted to do with his life (culinary career), had the certifications to do so (through his unique charter school), and proved to be an outstanding youth in the club, at his school, and in the community. One area that he struggled in, however, were the finer points of reading- as in completing the long, complicated paperwork that many teens have assistance with from parents or guidance counselors. Jason had never moved forward on his FAFSA form; each time, he either had computer issues, or didn't know how to complete a particular section. He was on his own, and the deadline was approaching. An individual here at Andson was able to assist him through this process (as well as document it for our blog) and got his application in on time. It wasn't that he didn't want to complete the application - he knew the financial consequences if he didn't - but he really needed someone there to make sure he checked the right boxes and read through each individual section. He may have not completed this application on time, and may have missed out on a semester of college without our help. The time then came where Jason wanted to get his driver's license. He called upon Andson to help with studying for the written portion of the test. Confused, but happy to help, we came to his rescue, and found he had failed the driver's test 3 different times. Jason could drive, he was even a good driver - but reading through the questions and preparing for a written exam was not his strength. Here was a young adult that works extremely well in his trade, but needed assistance with 2 very important pieces of growing up. Bobby is our second example. Here is a boy whose parents had no intention of trying to raise him with any sense of values or morals. At the age of 7, Bobby had never been to school, and had been encouraged to steal when necessary for his "family." Through nothing short of a miracle, he was able to be adopted by another family member and moved to a home that encourages healthy habits - one of those being actually attending school. By finding out about Bobby, we were able to work with him over the summer and help improve his reading skills, closer to that of a first grade level. It was also amazing to see his personality transform so quickly from untrusting and removed, to that of what a child should be. He is now involved in Andson Academics, after- school tutoring program to solidify the work done over the summer. These are just two examples of how individual-to-individual relationships can change futures. 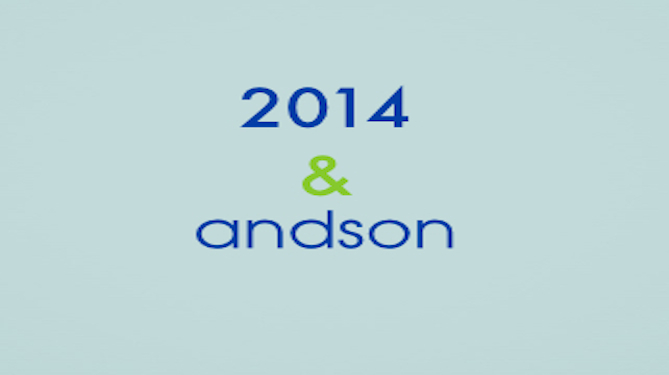 Andson wants to explore methods for mentoring youths of all ages and various backgrounds. We hope to make this a core activity of our organization in the near future. So we've touched on how to check your Credit Report before, but the site Lifehacker.com recently posted an article entitled "How to Effectively Manage Your Credit Reputation," which goes into further detail of making sense of the mess of Credit History that we deal with as adults. They also say that the best way to get your report is to use AnnualCreditReport.com.